1. I have recorded a very funny clip with my Sony 4K camera and would like to upload it to social sites to increase my followers but they tell me that they don't accept UHD formats. I wonder if I can do sth with the MTS, AVCHD, MKV videos like convert video to MP4 free to make my video qualified for the video-sharing sites? 2. Any HD free MP4 converter helps! I get an iPhone 6 Plus recently and the screen is really crisp. But how can I transfer my HD movies to the device? I know my iPhone accepts MP4 so any free video converter to MP4 recommended for this? 3. I heard that YouTube rolls out the first 8K video so I rushed to have a sneak peek of how the FUHD videos look like. Disappointed at the poor internet so I downloaded the clip only to find that it's not playable on the media player. I don't know any format stuff but I know that MP4 is the most widely used formats for media players. So is there any MP4 video transcoder can help with this? I mean, with the original quality saved! 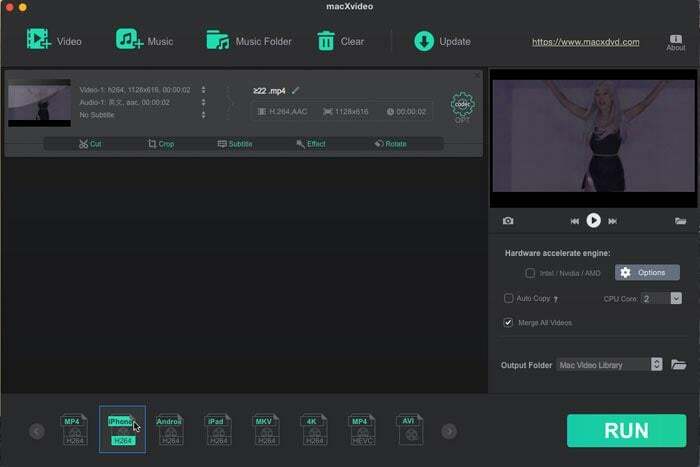 macXvideo - An impressive free MP4 video decoder & encoder, which converts all your local videos on desktop, like MP4 to AVI, MP4 to FLV, MKV to MP4, M2TS to MP4, MOV to WebM, etc. No adware, malware. Convert Video to MP4 Free is A Common Need, Why? As we mentioned above, a quick view of the forum can reveal scores of questions on how to convert files to MP4 video format. Why do so users look for free MP4 converters not other formats? Well, despite how big and confusing the world of video is, how many codecs there are, but one thing is known to all, MP4 is the most widely-used file format that is compatible with nearly all the mobiles and tablets as well as all the media players, while with high quality saved. So users need to convert MOV/AVI/MKV to MP4 free to make their videos more widely-accepted. But how? 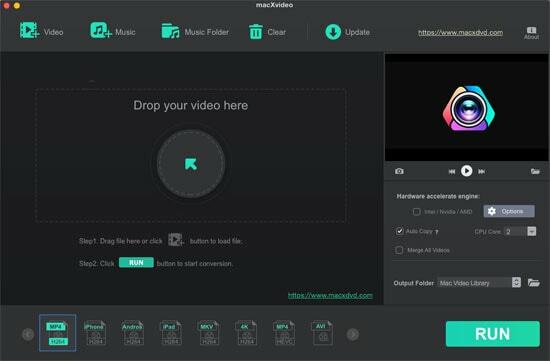 First, for users who want to convert video to MP4 free, there is one professional while totally free MP4 video converter recommended for you: macXvideo. It is an expert to convert videos in any format or resolution to MP4 format, like compress and convert 1080P HD/4K/8K MTS, AVCHD, MKV, AVI etc to MP4 video (or vice versa), or convert video to MP4 free for mobile devices, regardless of iPhone iPad Android. More importantly, it outshines other free MP4 converters for that it gives you the world's fastest speed (Intel QSV/Nvidia/AMD built-in) in the free MP4 conversion while keeps original quality (High Quality Engine). As an extra bonus, the free video to mp4 converter also does well in compressing video files sizes to the hilt, by up to 98% reduction. Still, you are able to make your videos unique through its editing features like trimming, cropping, merging, adding sutiles and effects, rotating etc. Our second choice of the best free MP4 video converter goes for Handbrake. Handbrake has been around for years and remains one of the best application to convert videos of any formats to another and works on a number of supported devices. Therefore, it does a good job in converting various of format into MP4 like MKV, AVI, MOV, FLV etc. 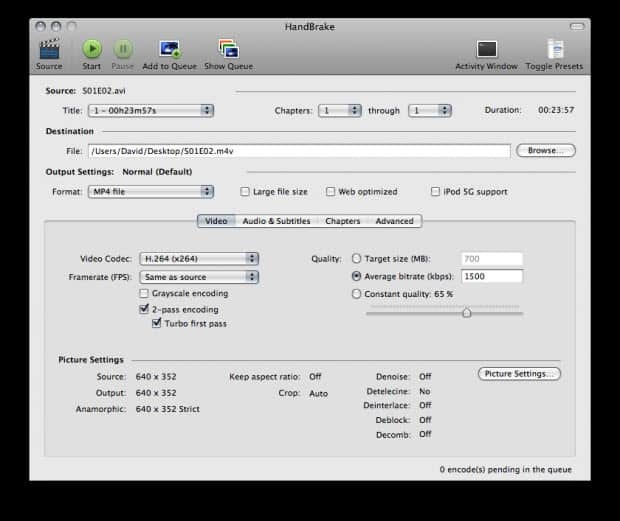 Note that Handbrake will also make mistakes sometimes when converting with Handbrake MP4 to AVI, MOV, MKV, FLV etc. like there is no valid title found, Handbrake audio and video out of sync, etc. And it crashes often with large-size 4K/8K HD videos. Besides, you should also know that Handbrake can free convert videos to MP4 and MKV, and that's all. You can't convert videos into other formats. The third free MP4 video transcoder comes a program with the same name: Free MP4 Video Converter. As it's name suggests, this free video to mp4 converter is able to convert video to MP4 format compatible with popular multimedia devices such as Amazon Kindle Fire, Apple iPod, iPhone, iPad, HTC, LG, Motorola, Samsung, Sony, etc. But there is no sign that it can convert or compress MP4 of HD/UHD 4k/8k 1080P videos. Note that this free video converter to MP4 may download all kinds of malware and adware, so be careful when you install the program. Before you start to convert AVI/MKV to MP4 free etc, get the MP4 video convert free download on your Mac. After you download this free video converter to MP4 on Mac, click "Add File" button to load video you would like to convert to MP4 with this free MP4 converter. To convert video to MP4 free, choose MP4 as output video format. Note: In addition to convert mkv to mp4, or mov/avi/flv to mp4, this free video to mp4 converter converts mp4 to mkv, avi, mov, flv, etc. And you can also edit MP4 video before or after MP4 conversion. Click Folder button to select a destination folder to save the converted MP4 video. Click "RUN" button and this 4K/8K HD free MP4 video converter will start to convert videos to MP4 with high quality. Well, to convert video to MP4 free from online sites with this free MP4 converter, you will need to click the button "YouTube", and put the target URL of the video to be converted to MP4 so as to download the video first. Remember that the MP4 video converter free downloads 4K videos to iPhone, or 1080P/720P HD videos as well in fast speed. Then you can convert the videos to MP4 or iPhone iPad Android devices as per the guide above.